Baroness Thatcher’s view of humanity as a sum of particles and atoms is in stark contrast with the sense of social solidarity expressed by the Chinese nurse attending a child pulled from the ruins of a school, after the 2008 Sichuan earthquake. While being interviewed by an American chain she was asked: - And what is your name? - My name is China. Margaret Thatcher’s perception of mankind is a reflection of David Ricardo’s economic theory, which aspired to be an exact science and as such it has been applied in England since the Industrial Revolution and generally in the Anglo-Saxon world. Ricardo’s ideas blend well with the political model imposed in England, since the 1688 revolution. It is based on the social vision of John Locke, a Calvinist sociologist, with links to the slave traffic, who proclaimed that the object of every society is the protection of property, life and freedom. This blend of ideas permeates the way social, political and economic issues are perceived in the Anglo-Saxon world until today. The Anglo-Saxon perception, which regards its political theories as a science applicable everywhere, in all circumstances, had early contradictors. The first one to clearly state that economic and political behaviour rules could change according to circumstances was the English philosopher Edmund Burke. In Germany and other European countries that kind of scepticism developed less abstract, less mechanic, more elastic, more organic ideas on political and economic issues, which were useful to work towards policy goals; goals which may differ according to national circumstances. Such an approach has multiple roots; one is romantic relativity, another is a dialectical interpretation of political issues and society, and finally the conviction that every social science must be based in a deep knowledge of historic evolution, which is the reason for it to be called the Historicist Economic School. This school has been marginalized from the economic discussion since the Second World War, in favour of the Anglo-Saxon classic school, whose more radical actualization is the Neo-Liberal Chicago School. Recurrent crisis and the scandalous increase in wealth concentration caused by the Anglo-Saxon theories at universal scale have shown the dangers of its unfairness for political instability. That has awakened a new interest in the empirical approach of the historicist school, as an option. The historicists approach is closer to human nature than Marxist traumatism and also has better success credentials on its application for economic development and equitable distribution of prosperity. The first one to use history to analyse the capitalist economic system emerged from the Industrial Revolution was Jean Charles Simonde de Sismondi. Since his first published work, A Picture of Tuscan Agriculture, his method was to research political history, government policies and economic behaviour, to find the links between stimulus and economic reactions. His conclusions were the first to show a divorce between the classic Anglo-Saxon school theories, of supposed universal validity, and real facts; between Ricardian abstractions and well-known economic practices. Sismondi was already well known as a historian, when he wrote about political economy. He had by then a wide political and social knowledge and firsthand experience on economic affairs. As a young man he worked for a trading company in Lyon, then he visited England in the middle of the Industrial Revolution, later on he became agricultural producer in Pescia (Italy) and executive officer at the Chamber of Commerce in Geneva. Those experiences gave him direct technical and practical knowledge on areas of basic importance in political economy. His historic vision included a documented perspective of the most important economic achievements in the Middle Ages: those of the Italian Republics. Those cities managed to uphold their independence and prosperity through the feudal age and monarchic absolutism, thanks to the military and political strength that came from their industrial and commercial wealth and their better distribution of profits among the citizens. Sismondi is often listed as the first socialist philosopher, because he discerned the surplus value (mieux value) of salaried labour, because he spoke about class struggle and requested state intervention to protect workers, because he proposed a minimum wage, job security and workers protection through sickness and old age, and still other social measures. All of them are today part of a socialist platform, but he addressed even more modern concerns, like the way to fairly distribute the progress on science and technology, which tends to harm employment and job security and exclusively favours capital owners. It is remarkable that the content of Sismondi’s New Principles of Political Economy has been systematically distorted by some writers, from Marx on. An example of such distortions is to say that Sismondi explains the recurrent systemic crisis of capitalism – that he noticed first - to under consumption. It is Marx and Lenin who believes it to be the cause. That mistake is found in publications devoted to him and we wonder how can it be so, because nowhere in his works does Sismondi attribute the systemic crisis to under consumption. Sismondi attributes it -very clearly- to an over production caused by the abundance of capital; he says so over and over. One old case of such mistake is that of the Polish socialist Henryk Grossman in his otherwise excellent book Simonde de Sismondi and his economic theories, where he states that Sismondi was the first economist to explain capitalism. In our days, we find shades of that mistake even in the well-written and documented book Sismondi, a precursor of Marx by Diego Guerrero. It could be that such mistake originates from Sismondi’s remark that the lower the salaries, the bigger the difficulty to absorb over production, because the internal market shrinks. But it doesn’t mean that he attributes the periodic systemic crisis to under consumption, he is attributing them to the greedy short vision of those who for immediate gain avoid thinking about the middle term consequences; a logical behaviour, maybe, from following theories that justify individual greed. The mechanics of such crisis, as explained by Sismondi, is that in those countries where there is a coincidence of abundant capitals looking for placement, and a culture of obtaining profits at the expense of salaries –like in England- there is a tendency to overproduce and create gluts. It is an economic environment where wealth and misery coexist; the solution is to place surplus produce in foreign markets, which is the root cause of modern imperialism. Another frequent mistake is to attribute a Malthus influence upon Sismondi, when in reality is just the opposite what happened. Sismondi was the first to contradict Malthus idea that population would overrun the means of production. Sismondi describes how much superior are the rates of reproduction in agriculture compared to human reproduction. He is also the first to notice the fact that human reproduction rate diminishes with the increase in instruction and prosperity. It is Malthus who later on shows to be influenced by Sismondi’s economic ideas. When we take a closer look at Sismondi’s technique and the perspective of his economic analysis, we find that his organic approach, his perception and his proposals fit much better within the Historicist Economic School. Some knowledgeable economic researchers like Werner Stark and Henry William Spiegel even consider Sismondi to be one of its founding authors. He was the first one that regarded the Anglo-Saxon School axioms as simple political options and refused to consider a science those abstractions and automatic mechanisms; he even considered them a fraud. As all the historicists, Sismondi objects that once applied to the real economy the Anglo-Saxon theories cause economic distortions and tend to concentrate wealth on an elite, at the expense of the rest of society. As them, he believes the social and economic cost of such unbalance to be immense, because its inherent unfairness causes contagious crisis that disrupts and sets back economic growth at both, national and international level. They all agree in the paramount importance of a closer balance in incomes, because as Sismondi said “ The salary given to a worker has the same effect as the seed entrusted to soil” because “commercial wealth follows the increase of incomes”. Sismondi objects Ricardo’s ideas because he says they deal with people as disposable parts, that Ricardo’s only concern is how to accumulate wealth and disregards the suffering caused by an unfair distribution, which he assumes that will automatically find a balance brought by the suffering itself. Sismondi’s objections to Ricardo’s theories were repeated by the first authors of the historicist economic school, who researched economics from the perspective of a historical sequence of economic practices produced and related with their surrounding environment. It is the contrary to the English allegedly scientific theories for universal application, where the only process for wealth distribution is the spill down effect; an image the brings to mind medieval charities, left-over’s distribution, or crumbs that fall from the rich’s banquet table. During the twentieth century, especially during its second half, the economic debate was polarized by the abstractions of Marxism and Anglo-Saxon liberalism. Both failed to create a sustainable general welfare, and therefore, in the twenty-first century there is a search for other options. The authors of the historicist school of economics are arousing a renewed interest. Their economic philosophy is humanistic, because it is derived from human practice and facts; it does not have, as the previous two, a claim to be a universal exact science of obligatory validity and enforceable erga omnes. Its humanism comes from believing that results from applying the same principles and economic policies may vary depending on the specific society circumstances and timing. Relativism is a prominent feature of the historicist approach and its policies can be credited with remarkable economic development successes in Continental Europe and elsewhere, in very different social and political environments. Without pretending at all to be exhaustive, we want to present in some brushstrokes Sismondi’s kinship with the historicist school of economics, which was influential in all of Europe, but German economic development was its most notorious success. The authors of this school developed an organic evolutionary vision of society, where the main is a realistic and therefore factual view of economic issues. The original link with Sismondi is obvious, when we remember that in Sismondi’s works the most conspicuous idea is that of history as the frame where all the sciences related to human dynamics can be placed. Such a perspective is quite clear in his New Principles of Political Economy and even more marked in his Studies on Political Economy, a later synthetic work, with new facts that support his previous arguments, seldom quoted, which exist only in the original Belgian edition of 1836. Our sketch only wishes to point out Sismondi’s coincidences with some of the most prominent authors of the historicist school of economics, which, although it is now neglected in most academic courses, we believe it should be studied, because it presents a more realistic option for a fair economic development. 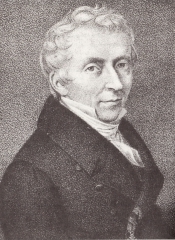 Adam Müller (1779 - 1829) is, along with Sismondi, a precursor of the historicist school of economics. He has coincidences with Sismondi in his criticism to the Anglo-Saxon school, which they accuse of pretending to rationalize in theory the pauperization of the working and the artisan classes. Both of them criticize its atomizing individualism and conceive the state as an organic social entity responsible for the general wellbeing. Both analyzed the role of the old corporations in employment stability and in the balance between production and consumption, even if they differ in what to do about them. Müller wants them back. Sismondi believes them obsolete and thinks that those advantages can obtained by a state that promotes the mutual interest harmonization between employers and workers. Both accuse the Anglo-Saxon school of giving too much importance to exchange value and to distance it from useful value; noting that there is a difference between being useful to society and being useful to the individual. Both of them discussed the effects of the division of labour, even if they reach different conclusions. Both considered the accumulated cultural and scientific heritage as part of a country’s patrimonial wealth. Müller highlights four aspects in economic exchange: the historical aspects, the sociological aspects, their interactivity and the evolutionary relativity. All were covered by Sismondi, who points out that Adam Smith himself "recognized that the science of government was experimental, that it could only be based on the history of the different peoples and could only deduce its principles from a judicious observation of facts. Then he comments:" the principles of political science should form an ensemble and derive from each other ". Friedrich List (1789 - 1846), is the German economist par excellence. He and Sismondi criticize the static approach of the Anglo-Saxon economic theory, because both interpret economics in a dynamic way. List does not quote Sismondi in the bibliography of his most well known book The National System of Political Economy (1885) but there are many similarities. One of them is to have analyzed the experience of the young United States of America and to have used it in their argumentation, with a similar interpretation of its economic and social behaviour. 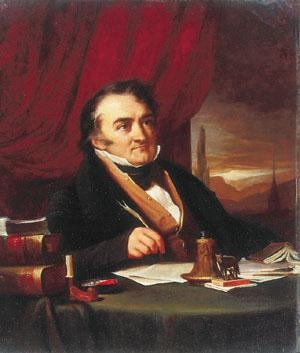 Unlike Sismondi who knew the American economy only by references, List spent five years in Pennsylvania and left his conclusions in his book Outlines of American Political Economy (1827) published the same year as the second edition of Sismondi’s Nouveaux Principes. Both use the same critical pattern in their analysis of the Anglo-Saxon liberalism and conclude that an economic policy based on the struggle between individual egotism, destroys internal national harmony and forces to solve domestic ensuing economic imbalance with an imperialist foreign policy. Both criticize the so-called Say Law - which Ricardo prises – that pretends that all production creates its own market. It would be right – both of them say- only if we make abstraction of time and space. Both also view state intervention as necessary to ensure a stable national economy, to limit competition and to promote industries that create jobs and wages, while avoiding the cartelized practices – replicated by modern corporations – of the old guilds system. Wilhelm Roscher (1817 - 1894) is known as the founder of the German historicist school and has significant coincidences with Sismondi. Both believe that the principles to achieve stable economic development and social wellbeing should be researched in the history of each society; but not only through the economic facts, but through the whole historical humanistic background: political, cultural, religious and legal. This is something that fits within Hegel’s dialectic and wider than Marx’s "dialectical materialism". Sismondi assumes this method implicitly, as something natural and it can be appreciated in his descriptions of historical development in national societies, including England, when he explains the structural trends of their economies and their trade policies. Both of them distinguish stages in the economic development of societies, which may differ differently, from the automatic results expected from the alleged truths of the Anglo-Saxon school. 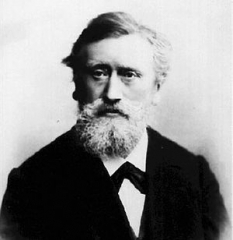 Roscher was a professor at the University of Leipzig since 1848 until 1854. 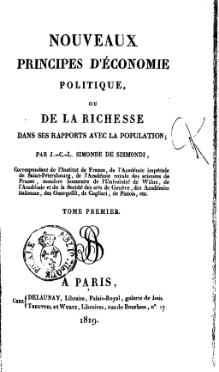 In 1854, twelve years after the death of Sismondi, he published his Principles of Political Economy, where he quotes Sismondi frequently. Both agree when explaining the mechanics of the demand for money and underline the advantages of metallic money, because of its intrinsic value and because it avoids the dangers of paper money, which can be devaluated easily and facilitates speculative credit, whose bubbles can be confused with a real assets; a very current issue in today’s economics. 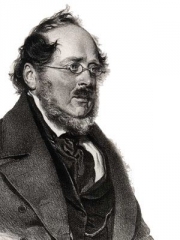 Bruno Hildebrand (1812 - 1878) was a professor at the University of Marburg and his critical book, Economics of the Present and the Future (1848) cost him an exile in Switzerland, along with his disciple Karl Knies. Like Sismondi, he considered that political institutions, along with other factors such as climate and religion, shaped the national character and influenced economic behaviour; this linking relation with the other social sciences is what makes each national economy a specific case. Sismondi and Hildebrand differentiate an economic policy based on real wealth from a credit-based economic policy, where passives may be confused with assets. It was to present his case against a credit-based economy that Sismondi outlined the example of Alexander Hamilton, first US Secretary of the Treasury, and his report to the US congress (1791) on financing the US industry. Karl Knies (1821 - 1898) thought that it was wrong to base economic science in the pursuit of individual interest. He thinks the moral development of society gives each historical stage its own characteristics; that studies to find guides for economic behaviour can only work by analogies, but without exact repetition, without scientific certainty. He said that to allow the national economy to depend only on the competition of market forces, whether national or global, is to deny the political concept of the economy, is to deny the state an active social role. Knies believed that both, the Anglo-Saxon liberalism and the emerging socialism, were inadequate to solve social and economic problems, but noted that the Anglo-Saxon school policies create the factual conditions that facilitate the triumph of socialism. Knies describes Ricardian theories as speculations with formulas based on a particular period, far from considerations of time and space, much as Sismondi did. It is curious that with those coincidences, Knies looks at Sismondi as a socialist thinker, a nonexistent term at his time. It is an arbitrary classification, because Sismondi had an evolutionary concept of social change; he wanted to improve the distribution of wealth through social policies without violent changes, which were destructive of wealth and ephemeral; Knies may have been influenced by Marx, who in his Manifesto of the Communist Party, as is well known, labelled the Swiss citizen Sismondi, as "petty bourgeois socialist" and anointed him as head of such a "school" in France and England. Gustav von Schmoller (1838 - 1917) drove the historicist school to reject the entire Anglo-Saxon economic theory and argued that one could theorize only when there was sufficient historical information on the economy, with coincidences in so many different circumstances, as to draw conclusions. Schmoller took economic methodological issues away from the Anglo-Saxon inductive and synthetic concept and placed them among the sciences of culture; a concept expressed in his phrase: "The economy today is a science only as much as it expands into sociology." This statement reminds the drastic commentaries of Sismondi on Ricardo’s automatic balances: "In political economy, we should be wary of absolute propositions and abstractions ... Nowhere are absolute amounts found, nor are there forces always equal; every abstraction is a fraud. Besides, political economy is not a science of calculation, but a moral science. It strays when guided by figures; it leads to its purpose only when it takes in consideration the feelings, needs and passions of men." 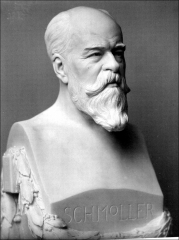 Schmoller was the chief architect of the Verein für Sozialpolitik (Association for Social Policy) founded in 1872, on the initiative of Otto von Bismarck, in the new consolidated Germany; it was copied later on in other countries, as with the American Economic Association. This German entity oriented the German social policy and encouraged the collaboration between employers and workers for mutual benefit in economic growth; just what Sismondi preached throughout his entire economic work and also as a historian. It is enough to look at the chapter on wages of his Nouveaux Principes where we find phrases like ". Equality in benefits always results in further expansion of the market for producers, while inequality always reduces it more" ..."Moreover, the rich are not the goal of the social order; wealth is not desirable in society but by the relief that it distributes among all classes." 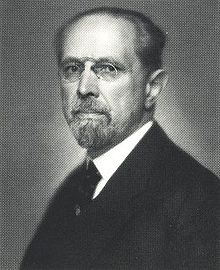 Max Weber (1864 - 1920) succeeded Knies at the University of Heidelberg. In 1904 he founded the journal Archiv für Sozialpolitik und Sozialwissenschaft with Edgar Jaffé and Werner Sombart. His research perspective of history separates what he calls "magic" from concrete facts, which are then analyzed for rational conclusions. That method led him to some conclusions that it is only now when their possibility can be foreseen. Weber thinks that the revolution that may happen is the opposite of what Marx prophesied; that there is a revolution underway leading to a dictatorship, but not the “proletarian dictatorship”, but that of the technicians of the business and government bureaucracy. Weber is well known for his sociological interpretation of the economy, which he exposed brilliantly in his famous work The Protestant Ethic and the Spirit of Capitalism, which underlines the Calvinist (Puritan) origin of capitalism, because it makes secular success in this world a clue of salvation in the next. Here we find a parallel with Sismondi, who also examined the influence of religion in the economy and explained how it influenced economic behaviour. There is a full chapter on its influence on unbalancing income and population, where he states that "Religious education has almost always helped to break the balance between population and the labour demand from which it should live." Then he caustically remarks that for married people abstinence is considered a sin while it is preached as a virtue to the celibate ones, a Catholic contradiction at its origin, which is preached by the reformed churches. Werner Sombart (1863 - 1941) combined the processes of history and economics to draw theoretical conclusions. His most important work is the monumental Der moderne Kapitalismus where he attributed the concept of capital to the double accounting, invented in Italy during the thirteenth century. He then develops his historicist perspective of the capitalist system over three structural elements: the spirit, the form and the technique. The spirit is dominated by the materialistic ideas of procurement, competition and rational selfishness. The shape is a private, decentralized system, regulated only by the market. The technique is a constant evolution in search of productivity. The rational egoism which always seeks profit, can measure it accurately thanks to an accounting system. Sombart also wrote several works where he applies the same historical methodology to specific topics such as The Bourgeois, Why there is no socialism in the United States, The German socialism and The Jews and economic life. In the latter he comments the work of his friend Max Weber and says it is because the Jewish essence of Calvinism, that this one influences the development of capitalism. Sombart thought that the discussion on whether to classify the economy as a natural science (nomothetic) or a cultural science (ideographic) was a sterile one. He proposed to look at history and economics from a vision of society that is neither a priori detached from reality or a kaleidoscopic description. The goal must be the understanding of the ensemble, in order to find the essence of the behaviour. The effort to understand must have a global vision, because, with the entry of new elements, behaviours may alter. Sombart does not look at the economy as a science of wealth, but as an instrument for social reform. It is an echo of Sismondi, who already said "The physical welfare of men, as much as it can be the work of the government is the subject of political economy". Der moderne Kapitalismus (The Modern Capitalism) can be read only in German. The exclusive rights for translation into English, according to what I have read, belong to Princeton University, which has neither done it, nor allows others do it. John Maynard Keynes (1883 - 1946) was the last English economist of universal renown and his most famous book is the General Theory of Employment, Interest and Money. Keynes does not belong to the Anglo-Saxon school, because, as he says in the preface to the Japanese edition of this book (1936), he considered "insufficient" the automatic balances of English classical school and instead considered state intervention as useful keep an economic balance. He was the head of the British delegation during the drafting of the Treaty of Versailles and resigned over disagreements. He exposed them in his book The Economic Consequences of the war where he warns over the harmful effects for the global economy of the "war reparations" (tributes) imposed on Germany. 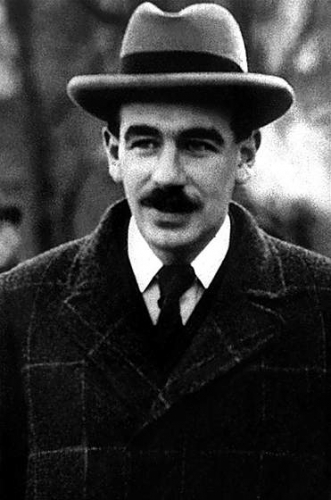 Keynes taught at Cambridge – his Alma Mater - was always a civil servant and even a member of the board at the Bank of England. In Bretton Woods (1944), Keynes - who saw the gold standard as "a barbarous relic" - opposed the proposal of the American Harry Dexter White to take the US dollar as an international currency, with a gold standard of US $ 35 per ounce of gold. Keynes proposal, which was not accepted, was to use an accounting currency called Bancor, issued by a supranational bank which played the role of clearing house. It would review annually the value of national currencies against the Bancor, according to the respective balance of payments. The Bancor idea deserves to be studied again, due to the present unaccountable fragility of the US dollar which is causing a general erosion in the value of capitals, savings and wages of the real economy; the economy without access to Quantitative Easing. The best-known contribution of Keynes to economic ideas is the notion that aggregate demand is the sum of consumption. Domestic demand – the cause of national economic growth- thus comes to depend on wages and employment. Governments can intervene, to stimulate employment and create wages, by public works. That idea, says Keynes in the preface to the Japanese edition, came by reading Malthus. It happens that Malthus touches on that topic en passant when he criticises the famous Say’s law, adopted by Ricardo, which assumes that all production will create its own market and can be accounted as income. Malthus contradicts Say with the same argument that used Sismondi and even quotes him, a detail that seems to have escaped Keynes attention. Malthus and Sismondi say that Say and Ricardo confuse production with rent, but it is Sismondi – not Malthus- who always insists on the importance of employment and equitable wages for economic growth, because wages are spent totally, wages are the demand, wages are the market. Sismondi's phrase, already quoted, "the wages given to the worker has the same effect as the seed entrusted to the soil" is a poetic metaphor that describes all the Keynesian doctrine on the role of employment and wages to sustain demand. As noted above, Sismondi deduces from this logic that global demand, in turn, would depend on the wages paid in the rest of the world. A very inconvenient thesis for the international economic relations of the British Empire, which at the time of Keynes, ruled in more than 400 million square kilometres. That may be the reason for the economist Lord Keynes not to quote Sismondi - not even in his bibliography- although he mentions Malthus as his inspiration. Keynes worked all his life for the British government, which ennobled him, despite having written in 1917 to his friend Duncan Grant: "I work for a government that I despise for purposes I think criminal"
Joseph Schumpeter (1983 - 1950) was an Austrian that, wanting methodological openness, broke with the so-called Austrian School; a neo-classical one that breed Ludwig von Mieses and Friedrich von Hayek. 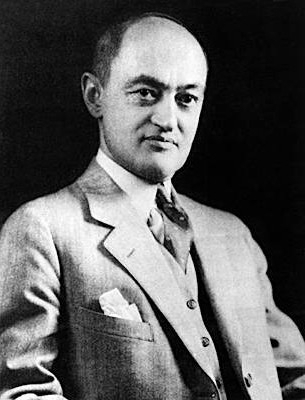 Schumpeter’s best known works are Theory of Economic Development (1912), Economic Cycles (1939), Capitalism, Socialism and Democracy (1942) and his posthumous History of Economic Analysis (1954). His basic idea underlines the importance of innovation in technology and organization for business, so economic development and productive capacity can be continuously improved. Something also mentioned by Sombart, his teacher. That process generates a dynamic economy where increased wages create new balances of demand and supply. It is interesting that in this dynamic, Schumpeter looks at interest paid to banks as a tax on inflationary credit. On the Anglo-Saxon kind of capitalism, he agrees with Sismondi, Max Weber and Werner Sombart on the perception that it inherent individualism and selfishness destroys the social fabric and observes that in such system the possibility for organic renewal of the elites in control wears out. It is something visible today in the camp led by the Anglo-Saxon world. Raul Prebisch (1901 - 1986) is the most famous Latin-American economist. It is likely that because he exposed his economic thesis when the political polarization between Anglo-Saxon capitalism and Soviet Marxism, marginalized the historicist school, his obvious links with it were overlooked. Prebisch, like Sismondi and the historicist school, noticed that when applied to real practice, international trade did not fit with the Anglo-Saxon theory, because the greatest power in the Anglo-Saxon capital manipulated the terms of exchange. As Sismondi said "if everyone seeks its own interest at the expense of others ... the strongest imposes his interest and the weaker knows that his own consists is not to resist." Prebisch describes international trade structure as an exchange between a group of countries that constitute an industrialized center and a periphery of countries who supply raw materials; a description that remains valid. Prebisch was formed on the economics of the Anglo-Saxon school, but the crisis of 1929-30, which found him working at the Banco Nación de Argentina and later as Argentina’s Finance Undersecretary, proved to be inadequate to handle it and Prebisch admitted the need for state intervention. Negotiations with England, in Geneva, during the crisis, convinced him that the Anglo-Saxon economic theory was intended for England when it was the country with most capital and most industry, but that such ideological projection of its own interests could be contrary to the prosperity of others. When he asked in his Introduction to Keynes (1947) "Why is it that the policies formulated and implemented in the industrialized centre do not get the same results on the periphery?" He admits that the Anglo-Saxon economic theory is not an exact science, that it is a hypothesis where the results vary depending on the context. That lead him to study what he called "structural historical elements." It was what Sismondi, List and all the historicist school of economics also did. Therefore his conclusions and proposals are very similar to those of Sismondi, List and the German historicist school: protection to develop a national industry in order to raise the standard of living in developing countries. As noted by his friend Luis Eugenio Di Marco, in his Introduction to International Economics and Development: Essays in Honor of Raul Prebisch. "As a development economist he always thought that wealth was a means and not an end" A principle expressed one hundred and fifty years before by Sismondi. There are other important historicist authors with economic proposals applicable to the crisis that the world economic system drags since 1971 and that now (2016) seems to be in its terminal phase. One of them is Torkel Aschehoug (1822 – 1909), who is the subject of a book by Mathilda C. Fasting. She mentions the importance that Aschehoug gave, a hundred years later to the contribution of Sismondi’s ideas to the Historicist School of Economics. Aschehoug summarizes Sismondi’s philosophy in the question that Sismondi poses to the English school in his Nouveaux Principes. How is it that wealth is everything and humans are nothing? That question, said Aschenhoug, is the fundamental economic argument of Sismondi, who reiterates throughout all his work that wealth is only a means and that humans beings are the purpose. “There is no such thing as society. There are individual men and women, and there are families.” Margaret Thatcher. Interview with Women’s Own magazine, October 31,1987. Reported by Sunday Times. Locke profited from slave traffic as investor in the Royal African Company and drafted the pro-slavery constitution of Carolina. J.C. L. Simonde de Sismondi, Nuevos Principios de Economía Política, Icaria Editorial, Barcelona, 2016. Título original, Nouveaux Principes de Economie Politique, translated by Umberto Mazzei from the Delunay’s edition, Paris, 1827. Sismondi. Nuevos Principios de Economía Política, Libro IV, Capítulo IV, Página 200. Icaria Editorial, Barcelona, 2016. Diego Guerrero, Sismondi precursor de Marx, Paginas 19, 20 MAIA Ediciones, 2011. It is a good book, but the title is misguiding, because even if Sismondi was the base of Marx’s methodology and socio-economic vision, their conclusions and proposals widely diverge..
 Sismondi, Ibid. Index, Book II, Chap. IV, Pag. 464. Sismondi, Ibid. Index, Book IV, title of Chap. IV, Pag. 468. Sismondi, Ibidem, Book VI, Chap. VII, Pags. 345 and 346. Sismondi, Ibidem, Book III, Chap. XIII, Pag. 178. Sismondi, Ibidem, book IV, Chap. V, Pags. 198, 199 y 211. Sismondi, Ibidem, Book VII, Chap. V, Pags.372 y 373. Sismondi, Ibidem, Book I, Chap. II, Pag. 42. Sismondi, Ibidem, Book IV, Chap. V, Pags. 206 y 207. Sismondi, Ibidem, Book IV, Chap. VIII, Pags. 221 y 222. The theory of economic development: an inquiry into profits, capital, credit, interest, and the business cycle. New Brunswick, New Jersey, Transaction Books, First German edition,1911, English edition 1934. Business cycles: a theoretical, historical, and statistical analysis of the capitalist process. Mansfield Centre, Connecticut: Martino Pub., 2006; History of economic analysis. London: Allen & Unwin, 1954. Joseph Schumpeter, Capitalism, Socialism and Democracy, Pags. 82–83. London: Routledge, 1976. Sismondi, Ibidem, Book VI, Chap. VII, Pag. 352.